Shop-Vac 5-Gallon 4.0 peak HP Wall Mount Wet/Dry Vac is centralized cleaning convenience for the garage, workshop, hobby area, laundry room, or anywhere a hands-free vacuum center is needed. Complete with wall mount bracket and an 18-Feet hose for wide cleaning area. Space saving hang up design provides a cleaning solution that is there when you need it. 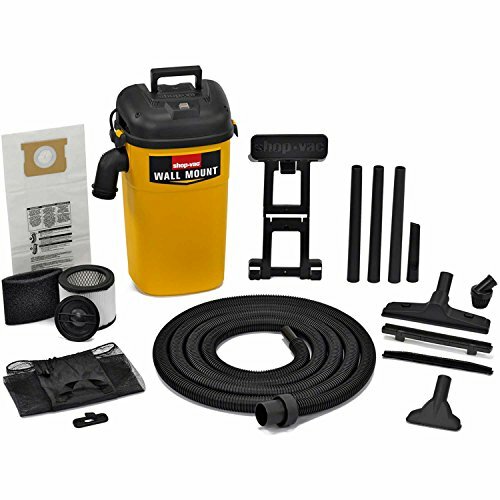 Comes with versatile accessory assortment that includes, 18-Feet by 1.25-Inch Lock-on(r) hose, 3 extension wands, 12-Inch nozzle with brush and squeegee inserts, round brush, gulper nozzle, crevice tool, wall mount bracket, tool bag and filters included collection filter bag, foam sleeve cartridge filter and retainer.